Beersbee combines everything you need for the perfect backyard drinking game. Frisbee’s, beers, and the outdoors, what else do you need? When you have a competitive group of backyard gamers playing you will see why most college students call Beersbee the Greatest Outdoor Game Ever! I think I would challenge this, but I do think it’s a very fun game of beer frisbee! Beersbee was originated from a very similar game, called Fricket. The objective is to throw a Frisbee at across the field knocking off your opponent’s bottle from the stand. It is a team game that requires skill, patience, but minimal physical activity so you can always have a drink in your hand. The game is designed to get you wasted and does not disappoint. It’s a game that can be played with teams of 1 to 3 people, so you can play with up to 6 people. 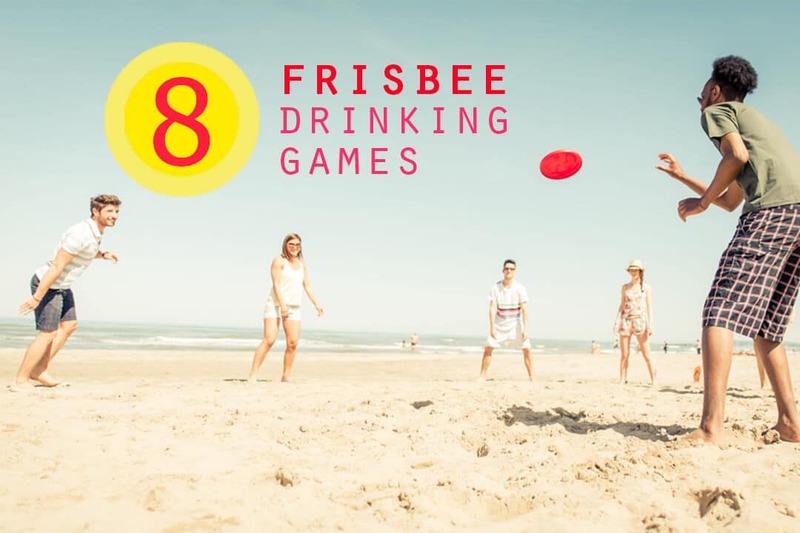 Beersbee is also listed on our 8 Frisbee Drinking Games and Top 15 Outdoor Drinking Games. For those who are not inclined to make their own set or wanting something more portable there are many great sets to choose from. We had made the mistake of purchasing this set on a 4-in-1 combo that was far too flimsy. You will want a pole that can either stick into the ground or with a base that will stay on solid ground. The Bottle Bash with Standard Surface model is what we use in our backyard. 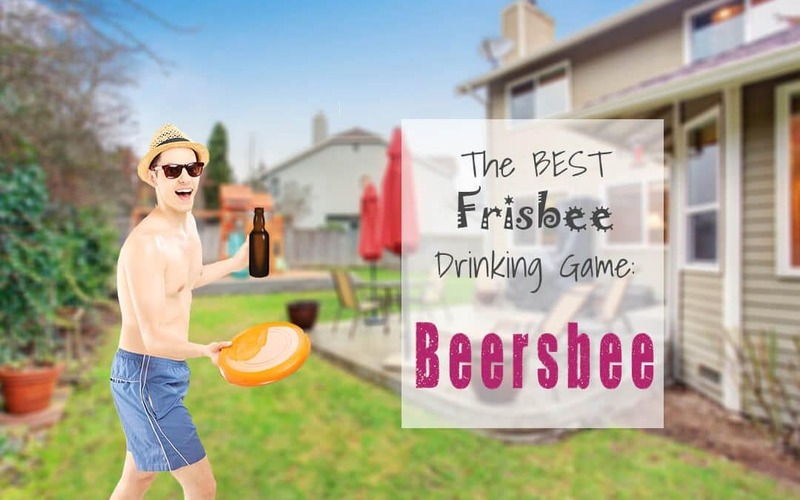 Beersbee is one of the easiest Frisbee games to learn, but hard to master. Find a field, backyard, or good spot at a campground to get started. Beersbee is meant to be played 2-on-2, but we like to modify the rules to be 3-on-3 or heck even 1-on-1. Teams sit on opposite ends of the field approx. 20-30 feet apart. Teams take turns alternating between throwing a Frisbee across the field at the target. The targets are a pole with a bottle, can, or ball on top. You get your points by knocking your competitors can to the ground. If you or your team drops the Frisbee the entire team drinks. The game is until 11 and switches sides when a team reaches 6 points. Just to keep it interesting! When teams cross you must high five! It is a real spectator sport that gets a lot of attention. The scoring system of Beersbee is built behind catch-able throws. The throwing team must have the best intent to hit the Frisbee in the zone or will penalized for an uncatchable throw. This means that it must not be lower then knee height as it crosses the fault line, this is called the catchable area. Not too high, or too far to catch outside of catchable area. If you do any of these 3 actions no points are rewarded and the next player throws. The rest of the points can be explained from the offensive and defensive positions below. The goal in Beersbee is to knock the bottle or can off your neighbors pole. You can either do this by hitting and knocking off the bottle direct (Dinger) or knocking it off by hitting the pole. 1 Point – Throwing the frisbee and knocking the bottle down by hitting the pole. With blocking the target (Goaltending) you will try to catch the Frisbee and the bottle from the throwing team. 1 Point Reduction – Catching the bottle that was knocked off by the frisbee reduces the points scored. 1 Point Penalty – Not catching the frisbee adds 1 point to the throwing team if it was a reasonable throw. Direct Hit (No Catch). Throwing Team hits target direct (2 Points) & Defense Team does not catch bottle or Frisbee. This would be 3 Points for the throwing Team. Hitting Pole (No Catch). Throwing team knocks off bottle but hits pole (1 points). Hitting Pole (Frisbee and / or Bottle Caught). Catching the frisbee does not reduce 1 point by prevents it from giving to scoring team. Throwing team knocks over bottle by hitting pole but catches frisbee (1 point). If Defending team catches both bottle and frisbee (0 points). We know there are many variations of this game. 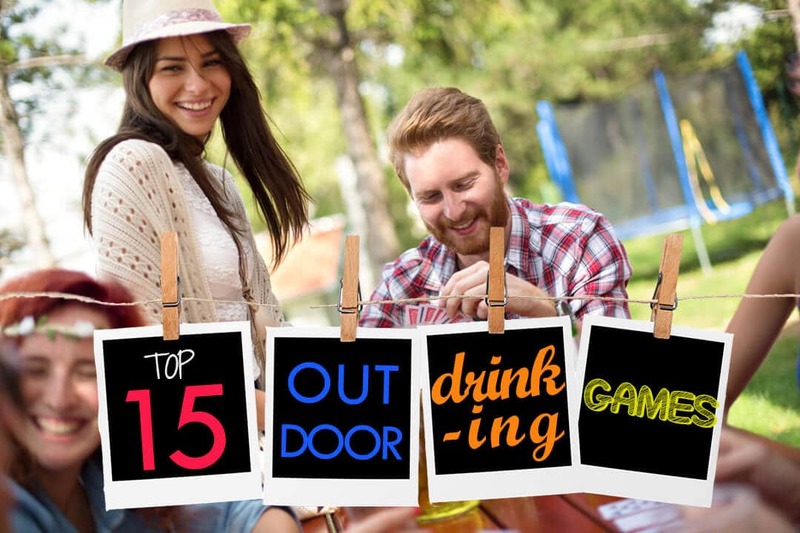 These rules are the Backyard Games Drinking rules we play at home. We encourage everyone to make their own twists to this game and add in any penalty / rewards drinking shots or funny activities. Beersbee thrives on sportsmanship and fun so make sure to always be honest and even if your defending team missed it. A Frisbee is considered out of play once it hits the ground. If it bounces before it hits the target then it does not count. Every time your team messes up you all must drink. This is no team sport with “I” in Team. You must always have a drink in your hand. If you put it down for 1 second without permission means entire team takes a drink. Even when diving you must not spill your drink. You drink once. Frisbee thrown in play must be catchable for the defending team. If it is not catchable your team has 1 drink. Frisbee thrown that are not catchable (too far or too fast) are deemed uncatchable and not points are awarded. Catchable Frisbee are thrown from where they land if behind the throwing line. Thrower must plant 1 foot where the frisbee stopped. Frisbees landing within 2 meters of target are thrown from the line. Loosing team must finish their drinks. This is a simple game to put together. Essentially you need to 5 foot poles with stands, 2 bottles, and 1 Frisbee. You do not want the pole to be too strong bouncing Frisbee’s off it it, so ideally you can either hit the target bottle on top or hit the pole knocking this down. I once tried to do this with a stump and was right out of luck. We have seen and built many different variations for this over the years. This has included stumps on the beach, hockey sticks, brooms, Ski poles, and once even a coat hanger. Ok, the coat hanger was a joke. The best sets are ones that were designed with PVC piping. The most important thing is to make sure when you find a pole is to cut the bottom of the beer can and make sure you form it to the pole so it is secure. This way when you put your bottle on top it will be secure.